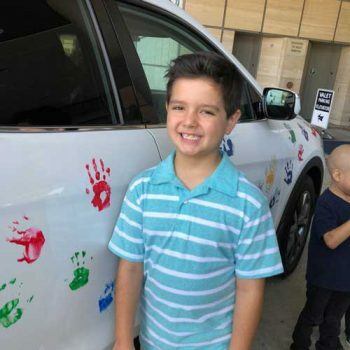 Grayson was diagnosed with Leukemia when he was four years old while on a family vacation. He just turned seven and has one year left of chemotherapy, which has gone well. Last year's Dribble for the Cure event opened up a whole new world for our family....UCLA Women's Basketball!! On that day, several of the players dribbled along with us all around the UCLA campus. We have become huge fans and followed the team their entire season. And what a season it was! Grayson made a special friend that day too, Ali Rosenblum #10. It was so exciting for our entire family to go to the games or watch them play on tv. It has meant so much not just for Grayson, but for the whole family. We beamed with joy when 2 players went to the WNBA at the end of last season. Even though it's hard for Grayson to dribble the ball and his walking is a little faulty at times because of the chemotherapy he receives, he is so happy to play ball with Ali and her team mates. He loves to high five them when they run out on to the court to play. It's made going into clinic for treatment a much better experience for him too. Now UCLA doesn't just mean going to see the doctors or getting treatment, but also going to basketball games or meeting up with Ali. We've gotten to know all the players names and where they are from. We've been so happy to go to Pauley Pavilion and cheer them on (even if it's after bedtime). Ali has been such a wonderful point of support for Grayson. She even came to sit with him during his treatment and eat with us at the hospital cafeteria. This all came from that special day last year at Dribble for the Cure.